Adriano joins Miami United FC! 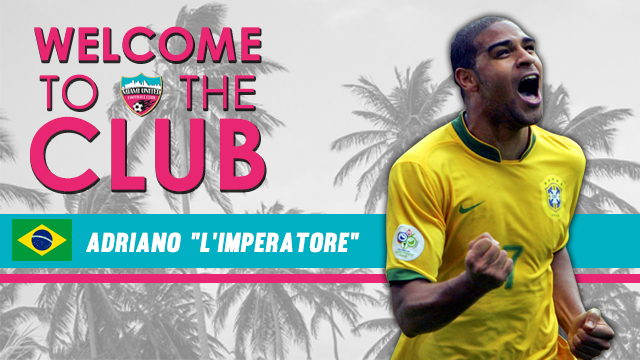 Brazilian striker Adriano aka “L’Imperatore” has officially joined Miami United FC. This is a major day for the club to say the least. Just days earlier MUFC also signed Honduran attacking midfielder and free kick specialist Julio Cesaer “Rambo” de Leon. Together Adriano and Rambo will provide top flight international experience to MUFC and its players. Miami United looks forward to starting its fourth season with such great talent and is ready to take on the NPSL’s Sunshine conference yet again. Such singings are a win win for both the fans and players. Not only will singings like Adriano and Rambo benefit the fans by bringing world class soccer to Miami, but with their presence, young players can look forward to benefiting from playing along side such awesome examples of soccer excellence. Adriano has represented Brazil 48 times as a member of the men’s national team scoring 27 times. He also competed in the 2006 World Cup, playing along side of other Brazil legends such as Kaka, Ronaldo, Julio Cesar and Ronaldinho. Below is a highlight reel from the Brazil’s match vs Australia. Adriano scores first! Adriano has played with some of the best and most renowned clubs in soccer, such as Inter Milan, Corinthians, São Paulo, and Flamengo. Adriano also has a long list of honors and accomplishments both at the club and international level. Check out these skills!